Integrated with IBM Watson applications, IntelePeer’s Atmosphere® creates delightful customer experiences with Voice, Messaging, APIs, and Workflow Automation. Integrated with IBM Watson applications and capabilities, IntelePeer’s Atmosphere® Communications Platform lets you seamlessly integrate omni-channel communications into your customer experience and business workflows for a complete communications experience. 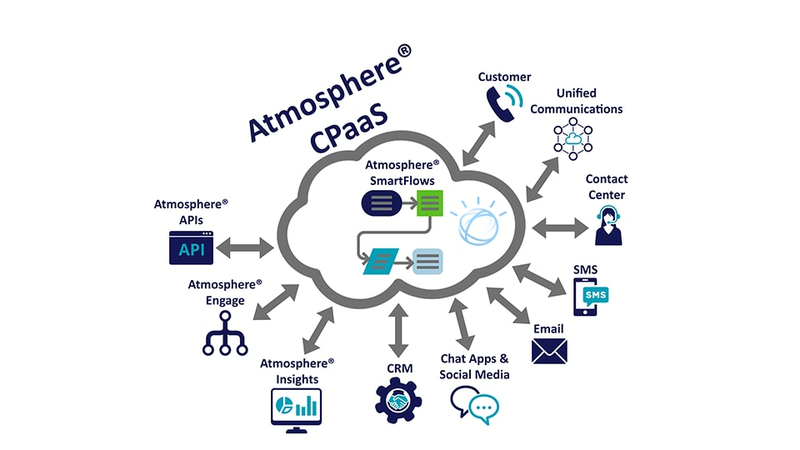 Designed to solve the challenges and complex needs of mid-size to large enterprises, Atmosphere® Communications Platform can be used to deliver world-class communications experiences, create more effective customer interactions, and improve business processes. Integrated with IBM Watson, IntelePeer’s Atmosphere® Platform lets you integrate omni-channel communications into your customer experience with Voice, Messaging, APIs, and Workflow Automation. Create omni-channel communication-enabled workflows, no coding required. Build, automate, and integrate communications anywhere your business needs it. All you have to do is drag and drop! Streamline business processes by integrating communications into your other business applications such as CRM, marketing automation, Contact Center software, billing systems, and more. IntelePeer integrated with IBM Watson applications include speech recognition, Text to Speech (TTS), Speech to Text (SST), Tone Analysis, Sentiment Analysis, Watson Assistant, and other capabilities.